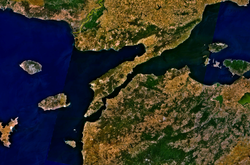 The Gallipoli peninsula (English pronunciation: /ɡəˈlɪpɵli/; Turkish: Gelibolu Yarımadası; Greek: Καλλίπολη) is in Turkish Thrace, the European part of Turkey. To the west there is the Aegean Sea and to the east there are the Dardanelles straits. This page was last changed on 21 November 2018, at 07:16.